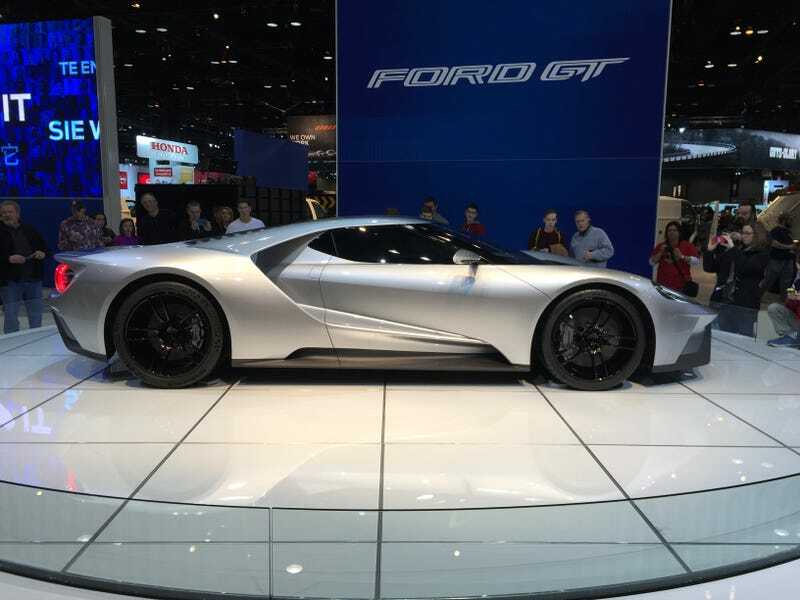 If you were unable to make it to this years Chicago Auto Show, fear not. While the Detroit show may get all the big press, the Chicago show is still a very impressive collection of cars and deserves at least a few minutes in the spotlight. While I could take a majority of the time talking about what a good time it was, how great most of the cars were, and how great of a day was had, I'm instead going to begin by shedding some light on the low points. Mitsubishi. That's all I really needed to say right there. Their current line-up displayed at the show is a conglomeration of soulless, unoriginal shameful rot boxes that aspire one day to resemble an automobile. They've failed miserably. I was first drawn Mirage. I wasn't drawn to it in the least by the styling or the performance or even the pink paint, which is barely striking enough to be considered pink. It's more an off shade of Bleehh than anything else. Owning a pink car in general is one of the most sinful automotive sins I can think of. "Thou shall not covet thy neighbors goods." I won't. Especially if 'thy neighbor' owns a pink Mitsubishi Mirage. The main reason that I was drawn to the Mirage is because it stands out, and not in a good way. The whole day I had been looking at the highest specced up versions of this and the newly redesigned that, and amidst that kind of competition, pink Voldemort here stuck out like the sorest of thumbs. I thought the Mirage was bad, then I got in the i-MiEV. It looks like the illegitimate love child between the Mirage and a Roomba. The plastics were coarse and nasty, the seat felt like a folding lawn chair, and the whole car gave off a very second-hand vibe. It was terrible, and it appeared to have been built using aluminum cans. Click here to watch me demonstrate just how flimsy this piece of crap is. For the pleasure of owning the nastiest new car around you have to cough up $21,000. You can buy a car for that! I shouldn't be to mean to Mitsubishi however, because both of these cars would be fierce competitors for the 1995 Car of the Year. The Ford GT was everything I had expected and more. It's low, it's sleek, it's everything they said it was. Pictures really do not do this thing justice, and the constant ring of of people surrounding the car in awe confirms my claims of this cars beauty. Acura NSX. It looks cool yes, and it was shown in a very nice color, but let me get this straight. It's a "production car" as Acura finally claims. This means that in a matter of a few months this thing should be rolling off the assembly line, and into the hands of professional road testers so they can tell us that it's almost as good as a 12C or 458, but the 650S and 488 leave it in the dust. If this is the case, then wouldn't you expect it to have more than half an interior? I don't know about you but I would be pretty aggravated if my NSX was delivered like this. Jerry Seinfeld and Jay Leno will be fighting trying to give the car to each other. If you're going to claim that you have a production ready car, you might want to at least make something that looks like It could be real to show off to the general public and potential customers. Way to boost my confidence that the NSX will actually be here within the next decade Acura. Kudos. The lack of manual transmissions this year disturbed me. There were very little to choose from, most of the offerings with them fitted coming from American companies. I saw an F-Type off in the distance with sticker on the windshield "#SAVETHEMANUALS" I naturally gravitated towards it. It was unlocked so I hopped in hoping to row through some gears and exercise my left leg only to find that the clutch pedal in this particular example was broken and permanently fully-depressed, as was I.
Alfa Romeo had quite the display this year showcasing the new 4C Launch Edition/Spyder as well as a few cars from their heritage collection. Toyota, as usual, took up far to much floor space as all the cars are basically the same barring the FT-86 shown this year in silver, some weird fish looking concept things that will never make it anywhere near production and weren't interesting enough for me to take my phone out to snap a picture, a SpongeBob Sienna which is awful, and a very clean example of a 2000GT. Mazda had a nice little set up with the New Miata displayed proudly with a shimmery white paint job. Just to the side of it was the cleanest robins-egg blue NA Miata I have ever seen. They also brought along all those other cars they have to make to fund the Miata, cause we know that's all they're around for. Dodge/Chrysler/Jeep/Fiat/Ram brought their usual set up. Jeeps crawling up things. Some middle of the road Challengers accelerating hard to 20 before slamming on the brakes to 'exhilarate' the passenger who waited approximately half their life for the ride. Hellcats made an appearance though both were locked and automatics. There was a 500 Abarth also cursed with a slushbox. I the corner of the Chevrolet display behind the crowd surrounding the new Zo6 sits a lone SS with a 6-speed. Nobody pays any attention to it, I sit rowing through the gears knowing that someday, after the Chevy SS is long disconnected, people are going to want them wondering why we never bought them new. The Mercedes-AMG GT was one car I was most looking forward to this year at the auto show, and while it is desperately pretty, it was pretty under-hyped. It sat on a solitary stand with very little happening around it. I think it was being neglected and I should adopt it and show it the love it deserves. BMW had some interesting cars like the X5M and the X6 which only really appeal to you if you're.... Weird. The i8 and i3 were pretty much the centerpieces of BMWs display. "Everybody say electric!" an overly enthusiastic mother calls out trying to get pictures of her children wiping boogers all over the interior of the i3. Aston Martin V12 Vantage S Roadster finished in carrot puree. McLaren 650S Spyder finished in.... well... Red. Remember that part a while back where I said I should start being nice to Mitsubishi? Well I'm not going to because amidst all their other crappy cars, they also brought a concept to Chicago this year. Would you like to see it? No? Well too bad, here it is. This abomination is the best their designers could come up with? Wow. So thats the 2015 Chicago Auto Show, now that I paid for $21 parking, you don't have to. You still should however because the Chicago Auto Show is a great way to see most of the stuff you read about from the Detroit Auto Show in the flesh without actually having to go to the Detroit show. Below are some more pictures, enjoy!